Santokh Singh – a former sports journalist, teacher and hockey coach – passed away on Friday evening (June 3) while watching a local soccer league on television. Santokh, 56, was a former journalist with the Straits Times and later a news editor at Singapore’s The Paper. He is survived by his wife, Sukhdevi, and four children: sons Ishwarpal (23), Jaspal (22) and daughters Jaskiran (20) and Parven (18). At the time of his death, Ishwarpal and Jaspal, both national hockey players, were taking part on the Gurdwara Cup tournament in Seremban, Malaysia. He was mentioned in a recent report on the Singapore Khalsa Association (SKA) golf bash that appeared in the Asia Samachar. See here. He had also commanded a brigade as an army reservist, according to one feedback received by the Asia Samachar. While teaching at Victoria School, he had coached the hockey team which went on to win a few national titles. “VS produced several national players from the squads Sooce and I trained including stars like Ganesh Sooceleraj and Masagoes Idris,” he said in an interview in 2011 published at the Old Victorians’ Association (OVA). See here. 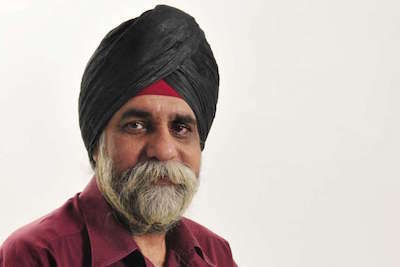 In an article in the Straits Times (4 June 2016) entitled ‘Former ST sports journalist Santokh Singh dies while watching his beloved Lions play football’, Sukhdevi said her husband died after dinner time as he watched Singapore defeat Myanmar 1-0 in the AYA Bank Cup in Sundram’s first game in charge. “It was after dinner and as usual, Santokh was taking his medicine for diabetes. He proceeded to watch the Singapore-Myanmar match while I was washing the dishes. “When I checked on him at about 7.50pm, he had collapsed and although we tried to revive him, he was unresponsive. But that is probably the way he would like to go. He just love sports,” she was quoted in the report. The report added that Santokh, a former school teacher, embarked on his journalism career with ST in 1995 and delivered a number of scoops and award-winning stories during a five-year spell. Known for his passion for football and hockey, he was a big winner at the Singapore Press Holdings’ annual awards in 1997 for the English/Malay Newspapers Division, winning the Feature of the Year Award for his story, “Better grades for sportsmen under change in ECA scheme”. It was a case of double elation for him as he also won a Special Award for his stories on the Jojo Sinclair drug scandal. Santokh joined The New Paper in 2000 before leaving in 2012 for Nanyang Polytechnic to become its director for communications and outreach.